USA prospect Jack Hughes is considered the ultimate prize in this year’s NHL Lottery. AP Photo via Getty Images courtesy Sporting News. Tonight at 8 PM, the NHL Draft Lottery takes place in Toronto. The festivities can be seen on NBCSN. Fifteen teams that missed the playoffs will all have a chance to win it. Of course, the higher you are, the better the odds. I’m not gonna rehash the whole thing. It’s pointless. The Rangers are sixth with a 7.5 percent chance of punching their ticket. Since the NHL Draft came into existence, they’ve never had the first overall pick. History hasn’t been kind. See 2005. I still can’t believe they fell from fourth down to number 16 before moving up to take Marc Staal at number 12. The famed Crosby Draft that was gifted to the Penguins, saving their franchise from possibly leaving Pittsburgh for Kansas City. Even when they had a high draft pick, former GM Neil Smith took Pavel Brendl at number four. A huge bust who at least was packaged to the Flyers for Eric Lindros. He also traded with Calgary to select Jamie Lundmark in the same ’99 Draft that cost Marc Savard. Holy moly. There have been other swings and misses. Glen Sather took Al Montoya at number six in ’04 when they had Henrik Lundqvist. They didn’t know he’d become great. It was right before the lockout. Hugh Jessiman remains the biggest bust in a deep ’03 Draft that still featured Zach Parise, Ryan Getzlaf, Brent Burns, Corey Perry, Patrice Bergeron and Shea Weber. 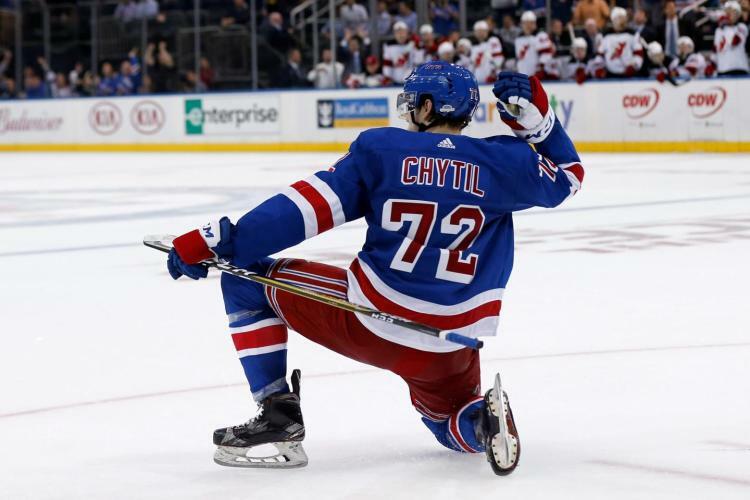 The best first round picks by the Rangers have been Staal, Chris Kreider, J.T. Miller, Michael Del Zotto and Brady Skjei. All taken later. It proves that you can find good players even if you don’t pick in the top three. It’s important to note that the 2019 NHL Draft isn’t just only Hughes or Kakko. They’re considered can’t miss prospects, who can make a big impact. However, with several good players including Vasili Podkolzin, Dylan Cozens, Bowen Byram, Kirby Dach, Alex Turcotte, Trevor Zegras and Arthur Kaliyev, it has the potential to be a deep draft. When they go live later, they’ll reveal 15 thru 4 first. Then comes the big drama of the top three. At least it won’t be as late as last year. They did the first part during one intermission and the second following another period in the postseason. It didn’t make sense. It should be better as a stand alone event before the NHL Playoffs kick off tomorrow with four series getting going. I’m sure I won’t be the only one with an eye on this silly lottery. Hasan’s team has won it before and they are ranked third best. But as he would point out, winning the lottery doesn’t guarantee anything. Look at Nico Hischier and Nolan Patrick so far. At least the Devils chose the right player. It’s hard to fathom how Patrick was considered better than Elias Pettersson. As you can probably tell, I’m not expecting much. The Rangers have never had much luck. In the second straight year without a postseason that has left Lundqvist miserable, it would be nice to at least move into the top three. They have over a 20 percent chance of that happening. It’s more realistic. As long as they don’t drop, I’ll be fine. Chris Kreider and Pavel Buchnevich celebrate Buch’s tying goal in the final Rangers home game. AP Photo via Getty Images courtesy Rangers. Game 81 of 82 will just be a footnote in a season without the playoffs. However, the final home game was exactly how I’ll remember the ’18-19 New York Rangers. Playing for nothing but pride for the true fans who showed up that weren’t tourists with no idea what was going on, they gave a honest effort to make the Blue Jackets earn the playoffs. Sure. MSG isn’t the same loud arena anymore. But the passionate diehards like us and some of our long time favorites who came got to meet former Ranger Nick Fotiu. That was a special treat. Getting to chat with one of the most popular Rangers alumni was pretty cool. Even if it was a mandatory gig for “Nicky” as my father and other older generation fans called him. I enjoyed spending time with him and appreciated his candor on our seats being the best along with other stuff he shared. Glenn Anderson was also there signing autographs for lucky fans like my brother. So too was Ron Greschner, who like Fotiu posed with fans for the scoreboard and tossed free t-shirts to the crowd. It was nice. What was nicer is that the team responded the right way to one of their worst games of the season. By earning a point on Pavel Buchnevich’s goal with over seven seconds left which I sarcastically predicted to our regulars who were all standing, the Rangers are up to 76 points with one final game remaining tomorrow at hated Pittsburgh. Wouldn’t it be something if they drove gamblers nuts by taking the Pens to overtime? That would put them right at 77 points with the Over/Under crowd nervously watching. Yes. Buchnevich getting his 21st by sticking with it to bank one in past a ultra sharp Sergei Bobrovsky, had to drive the Columbus bench crazy. Our friend told us that John Tortorella was going cuckoo. Haha. It was only their playoff livelihood on the line when the three-on-three overtime started. Too bad they didn’t have to sweat it out more in the silly shootout which Artemi Panarin won to help them reach the playoffs. A Bobrovsky save on Tony DeAngelo in the top of the third allowed Tortorella and the Jackets to breathe easier and celebrate eliminating Montreal. So, the Rangers fell in the skill competition 3-2. But it was the one shootout we stayed for due to it having an impact. Plus I wanted to see the boys a final time before exiting. At least it was quick. Bobrovsky stopped all three Rangers shooters while Alexandar Georgiev went 1-for-2. He couldn’t stop Panarin, who is lethal coming from that left side and unleashing that wrist shot. Outside of that, Georgiev turned in another worthy performance by making 39 saves. He was superb. Alexandar Georgiev makes one of his 39 saves in tight. AP Photo via Getty Images courtesy Rangers. Bobrovsky was even better. He only finished with 25 saves, but you wouldn’t have known it if you watched. What a sensational goalie. He’s the only reason the Blue Jackets are in the postseason. If not for his brilliance that again included a highlight reel save to rob Brett Howden on a two-on-one, there likely would be no playoffs for Columbus. These are the type of saves the two-time Vezina winner has made over the past two months. He’s a great goalie. I’d love to see him have success when it counts. I thought Columbus started squeezing their sticks due to how closely fought the first period was. Even though they held a 15-6 edge in shots, they couldn’t beat Georgiev. He stoned them on a couple of point blank chances. The thing I took away is what I’ve been saying. The team plays harder for him and gives Georgiev most of the shots from the outside. If he sees it, he usually stops it. His positioning is very calm and he moves well side to side, taking away the bottom of the net. A couple of goalposts were hit by both sides. Mika Zibanejad had one on a strong power move around the net. The Jackets probably felt like they created some excellent chances early on. Not capitalizing had to make them nervous. It showed in the second. They started missing the net a lot. Especially Cam Atkinson. The shooters were trying to go high on Georgiev, which is the adjustment I’d make. But they were unable to get close to scoring on him. He stopped 11 more shots and took a 1-0 lead to the locker room. Chris Kreider provided it by converting a two-on-one feed from Zibanejad for his 28th. A well executed play from both. Zibanejad got a step and sold the fake shot on Seth Jones, who bit. Mika then passed for Kreider, who blew one by Bobrovsky for the one goal lead. Kreider easily could’ve had more if not for some big saves by the Columbus franchise netminder. If they lose him this summer, oh boy. He’s easily a too five who can carry teams. Florida will come calling. The pressure was on the Jackets. They didn’t want to have to go to the 82nd game at Ottawa. Montreal was set to host bitter rival Toronto. It sure would’ve been interesting. I wouldn’t have been home anyway due to wrestling we are going to see at MSG. Not WrestleMania. But Ring Of Honor and New Japan. It should be good. It took a key mistake by the Blueshirts to allow the desperate Jackets to score. A bad pinch led to a three-on-one. Nick Foligno was allowed to pass across for Ryan Dzingel, whose one-timer whizzed by a helpless Georgiev to tie the score at 2:25. Fotiu told me that should never happen. Especially the pass. Always take the open man and give the goalie the shooter. There’s a reason he played in the NHL. I also loved what he said about the instigator. If you’re gonna fight, then fight. Truth spoken! With the game tied, Columbus still needed something from their top gun. For the most part, Panarin and Atkinson had their hands full with the Zibanejad line. They were forced to play defense more than they’d like. I thought Tortorella made a mistake flipping Pierre-Luc Dubois and Matt Duchene. Duchene has no chemistry with Atkinson or Panarin. Not surprisingly, they weren’t that effective. It took a great individual effort from the Bread Man to put the Jackets ahead. Taking a David Savard feed in his own zone, he backed up Howden and turned DeAngelo inside out to fire a laser high stick side past Georgiev at 14:27. Game over? Not so fast. With Georgiev pulled for an extra attacker, the Rangers got their chances due to a few careless Columbus icings. With the Rangers pressing the action, Buchnevich had his initial shot blocked. But he stuck with it by sending another towards the net with Howden in front. Sure enough, it banked in with just over seven seconds remaining in regulation. I know it didn’t mean a whole lot. But after joking that they should make Columbus sweat it out and kiddingly predicting a goal with two seconds left, you better believe I celebrated the Buchnevich tally. I even low fived a cool MSG security guard I was chatting with about our fun crew who were jokingly pulling for Columbus. I wanted to see overtime. Even if it meant another point. I don’t care about the logistics of the stupid lottery. Can you believe the Rangers are holding a viewing party at some dive? Gee whiz. Who’s playing at the Theater anyway on Tuesday night? I bet they also bring back the Draft Party with the team having so many picks. Zibanejad got the best chance in the three-on-three. But Bobrovsky wasn’t having it. Neither was Georgiev, leaving it to a shootout. After Kevin Shattenkirk fanned on his attempt, Georgiev stayed with Atkinson by getting a toe on his forehand deke. It was tremendous. Out came Panarin after Bobrovsky gave Zibanejad nothing. He shot the Blue Jackets to the playoffs. Then Bobrovsky denied DeAngelo to finish matters. Notes: Lias Andersson had another good game. He hit the crossbar during the second when the Rangers had the Blue Jackets on the ropes. He’s looked much more confident the last few games. A good sign moving forward. … Fredrik Claesson sat out. That allowed rookie Ryan Lindgren to dress and pair up with Neal Pionk, who looked more at ease throughout. Lindgren nearly had his first NHL goal in the first. He played sound defense and looks like he can help the team in the future. If both he and Libor Hajek make the roster next Fall, it bodes well. … Mets Noah Syndergaard, Jeff McNeill and Edwin Diaz took in the game on their off day.